As we begin 2018, one topic that’s on the minds of audio professionals across North America is the TV broadcast spectrum repack, set to begin in the second half of the year. Television stations will cease broadcasting in the 600 MHz band, and cell phone companies will begin using that space. Displaced stations are either going dark or moving to lower frequency bands, making an already-crowded RF spectrum even tougher to navigate for users of wireless microphones, IEM, and communications systems. For many companies and organizations, losing the 600 MHz band means a significant number of wireless systems must be replaced. Some are wondering if these purchases can be delayed or spread out over the next eighteen months, and the answer is not simple. What should we expect between now and July 2020? The repack process is like a dance, choreographed by the FCC in conjunction with broadcasters. Because many stations are moving to RF channels that are currently occupied by other stations, these moves must be made in a coordinated fashion to minimize interference between transmitters. These dependencies are referred to as ‘linked station sets’—the largest of which consists of 94 stations across the Mid-Atlantic and Southeastern US, followed closely by another set of 89 stations in the Northeast and Canada. This ‘dance’ is scheduled by the FCC across ten phases (pictured below), ranging from one to four months each. In some markets, like Boston, the repack will be gradual, spanning multiple phases and almost nine months. Conversely, the Dallas market (among others) will transform during just one phase, over the course of two months. This phase schedule is the basis for the Repack Timeline Overview chart featured below. There are already some great resources that illustrate the final post-repack layout of the VHF and UHF bands available—for instance, Radio Active Designs has a very easy to navigate tool here that covers many different markets. Until the repack is complete, however, things are still murky. 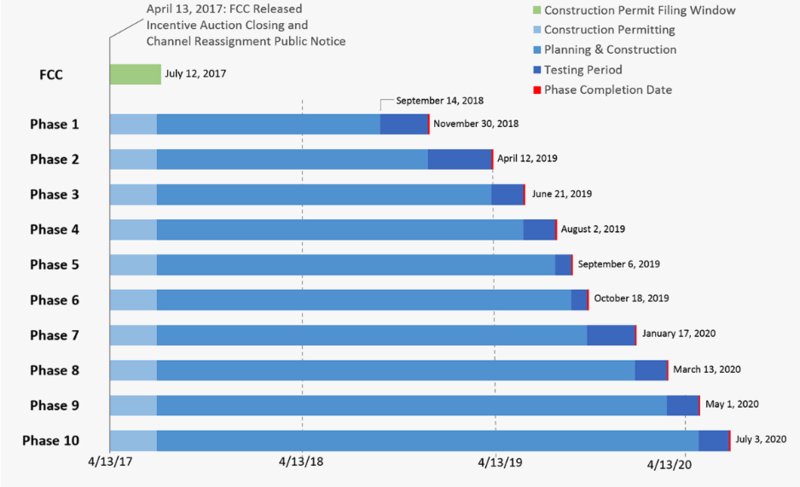 The FCC’s transition documentation only includes stations that are changing. With IMS Technology Services needing to navigate all these changes I created The Repack Timeline Overview Chart. It was compiled by cross-referencing current spectrum data to the FCC’s Phase Assignment Timeline, giving us a window into the near future. An excerpt is below, you can download the full document here. The FCC’s schedule for New York, Boston, and Dallas spectrum repacks. What should we be prepared for? As TV stations in the 600 MHz range shut down their transmitters, cell phone providers will begin to test and deploy their systems. T-Mobile, eager to roll out service, has already begun to provide financial incentives to stations that can move earlier than their expected date. Thus, the Repack Timeline Overview is a best-case scenario—many changes may happen earlier. The message is clear: the 600 MHz band is not ours anymore. We are going to see a lot of changes in our RF environment over the next few years. Some of these changes (like TV stations going dark or changing frequency) can be anticipated and planned for, as broadcasters have a duty to inform the public when a station goes off-air. Other changes, such as cell providers testing new systems, may happen without warning. Thus, getting out of the 600 MHz band should be a top priority for production and rental companies as well as venues, houses of worship, and installation environments. However, even if your wireless gear is in a ‘safe’ band, your work is not done. The repack affects the entire spectrum—not just the 600 MHz band. Frequently scanning the RF environment and using professional frequency coordination software is essential to ensure as smooth a transition as possible. 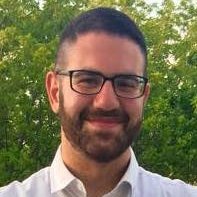 Aram Piligian is a Senior Audio Engineer for IMS Technology Services. IMS Technology Services is a woman-owned Event Staging, Integration & Managed Services business. They specialize in delivering presentation, collaboration and unified communication technologies that drive ROI and enhance communications to meet the goals of the organizations they serve. IMS headquarters is in Garnet Valley PA with a satellite office in Orlando, Florida.